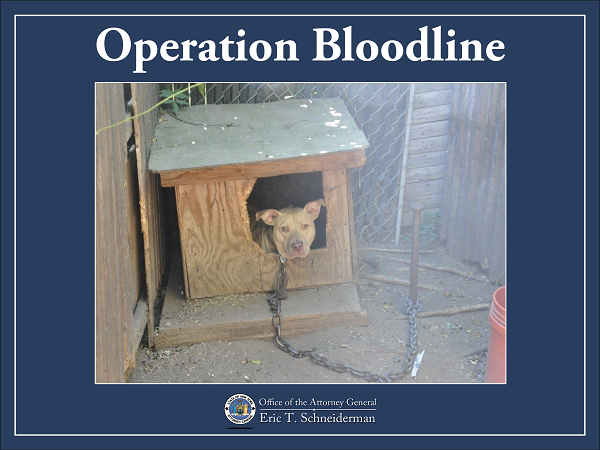 SUFFOLK COUNTY – Attorney General Eric T. Schneiderman and Suffolk County Police Commissioner Timothy Sini today announced the takedown of a major dogfighting ring in which the defendants are alleged to have actively engaged in breeding and training American Pit Bull Terriers (“Pit Bulls”) for profit. 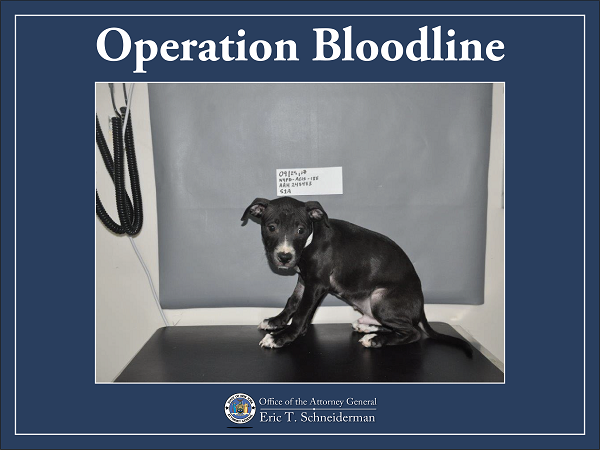 The investigation, dubbed “Operation Bloodline,” resulted in the rescue of 36 pit bulls and three felony arrests. 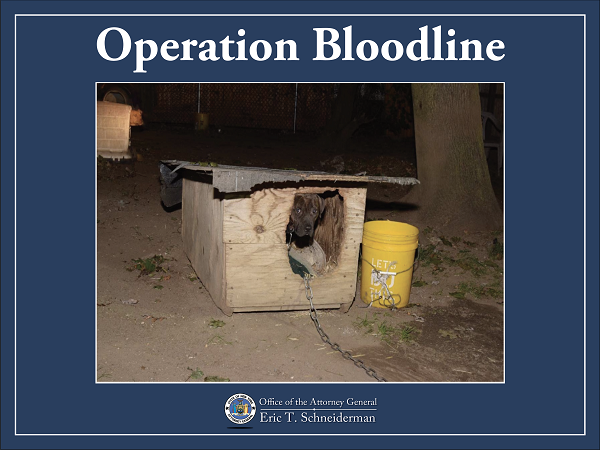 The Attorney General’s Organized Crime Task Force and the Suffolk County Police Department were assisted in their investigation by the New York City Police Department’s Animal Cruelty Investigation Squad (“ACIS”), as well as the American Society for the Prevention of Cruelty to Animals (ASPCA), which offered their expertise in evidence collection and the removal and sheltering of the rescued animals, and the Town of Babylon Department of Environmental Animal Control (DEAC), which also provided shelter for some of the rescued animals. 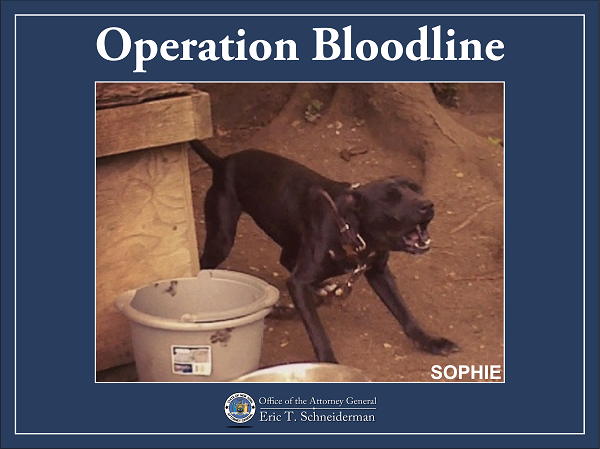 Beginning in March 2017, the Attorney General’s Organized Crime Task Force (OCTF) and the Suffolk County Police Department (SCPD) launched “Operation Bloodline” following reports of dogfighting on Long Island. 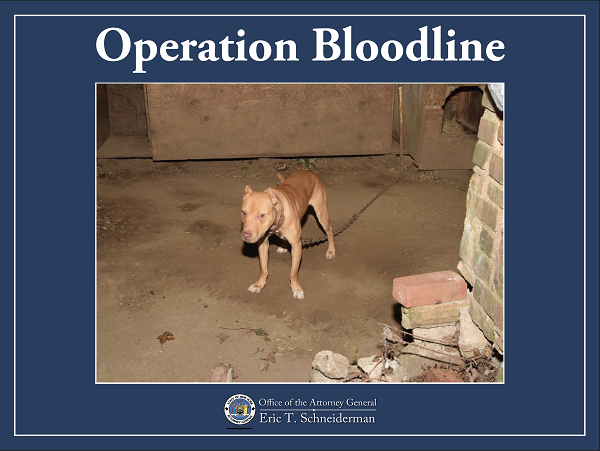 Beginning on September 28th and continuing through yesterday evening, investigators executed search warrants at two Suffolk County locations: 38 Birch Street and 135 Irving Avenue, both in Wyandanch, seizing evidence and rescuing the 36 pit bulls (ranging in age from one week to seven years). Prosecutors allege that the dogfighting ring had been operating at those locations and elsewhere in Suffolk County since at least March, when they first began the investigation. Richard Davis, 34, of 38 Birch Street, Martin Newkirk, 49, of 135 Irving Avenue, and Taikeem Wheeler, 26, of 165 N. 26th Street, in Wyandanch were arrested yesterday and arraigned today on complaints charging each of them with multiple felony offenses of Prohibition of Animal Fighting in violation of New York State Agriculture and Markets Law §351(2)(b), Conspiracy in the Fifth Degree, and other Animal Cruelty crimes. The defendants are alleged to have each operated a so-called kennel that actually served as staging ground for the dogfighting ring: Davis operated the Roll Right Kennel on Birch Street; Newkirk operated the Rise ‘n’ Shine Kennel on Irving Avenue; and Wheeler operated the Across the line Kennel on North 26th Street. As a result of this investigation, 14 pit bulls were rescued from Davis’ 38 Birch Street home; over 20 pit bulls were rescued from Newkirk’s 135 Irving Avenue home; and two pit bulls were rescued from Wheeler’s 165 N. 26th Street home. Over half of the dogs rescued are puppies. All 36 of the pit bulls were found virtually imprisoned in deplorable conditions, often tethered to heavy chains and segregated from one another, with no visible food or drinkable water, and with injuries consistent with earlier fights. One had an untreated broken front leg and another was significantly underweight. Virtually all of the adult pit bulls had fleas, dirty coats, and long claws, evidence of their solitary life on hard ground and indications of rarely having ever been walked. The majority of the pit bulls were found with numerous bite wounds that left scars; none appear to have been treated by a veterinarian. Police recovered numerous items of dogfighting paraphernalia at 38 Birch Street and 135 Irving Avenue that demonstrate the sophistication of the alleged training and breeding of these dogs by Wheeler, Davis, and Newkirk. Those items include bloody breaking sticks (which are designed to separate pit bulls when one’s jaw becomes latched in a grip on its opponent while engaged in dogfighting), as well as numerous heavy chains, double-thick dog collars, weighted dog vests, treadmills, and performance-enhancing dietary supplements. These items are often used to build strength in a pit bull’s neck and shoulders, to control its weight, and to increase its endurance and stamina, as a dogfight to the death can last longer than an hour. Dog fighters often make their money by selling dogs from strong “bloodlines,” descended from other successful fighters. Many of the pit bulls rescued in this case were of the RedBoy, Jeep, and Beast bloodlines, which are well-known bloodlines that dogfighters attempt to pass on through breeding, for the sole purpose of developing future pit bulls that are aggressive and willing to engage in dogfighting. Several were infected with a red blood cell parasite known as Babesia gibsonii, which is substantially more prevalent in fighting pit bulls. Unfortunately, two of the dogs had to be euthanized because they had been attacked by their mother. A third dog, named Sophie, had been so abused and tortured that the ASPCA determined that she had become a threat to humans and had to be euthanized as well. Wheeler allegedly touted Sophie’s prowess as a dogfighter, citing her bloodline as the daughter of one of his other pit bulls who had won multiple fights. The rest of the dogs are currently being sheltered by the ASPCA in order to allow them to heal and hopefully be retrained and adopted. Dogfighting is a crime in all 50 states. In New York, dogfighting and the breeding and training of dogs for that purpose are felonies, and each charge carries a maximum penalty of four years in jail and a fine of $25,000. Breeders of pit bulls sell the offspring of fighting pit bulls for upwards of $1,600 per puppy. The fights themselves are often to the death, with owners and spectators placing bets on the outcomes. In May 2013, the Attorney General announced his Animal Protection Initiative, which included the goal of shutting down underground animal fighting rings across the state. New Yorkers can provide anonymous tips about potential animal fighting rings or report animal abuse by calling 1-866-697-3444. For more information on Attorney General Schneiderman’s Animal Protection Initiative, visit www.ag.ny.gov/animals. The charges are merely accusations and the defendants are presumed innocent unless and until proven guilty in a court of law. This case was investigated by OAG OCTF Investigator Derek Stevens, under the supervision of Supervising investigator Paul Grzegorski and Deputy Chief Christopher Vasta and Chief Dominick Zarrella, as well as SCPD Detective Philip Alvarez, under the direction of Police Commissioner Timothy Sini. The case is being prosecuted by OCTF Assistant Deputy Attorney General Thomas Luzio, under the direct supervision of OCTF Deputy Diego Hernandez. Deputy Attorney General-In Charge Peri Alyse Kadanoff runs the Organized Crime Task Force.